Over the past three years, prices for aerial lifts have been going up and down, partly because of rising costs of materials and regulatory compliance, and partly because of increased competition from imports. To help buyers of aerial lifts make the best purchasing decisions, IBIS, a global leader in the publication of business intelligence, has produced a procurement report on aerial lifts. 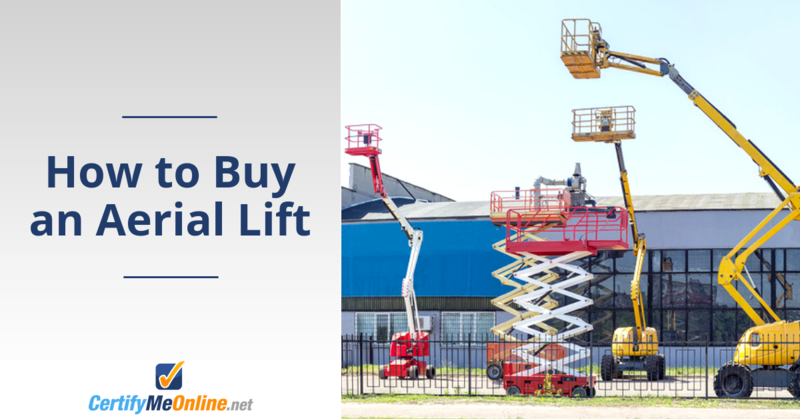 Buying a new aerial lift is one of the most important purchases your company can make. If you buy the “right” lift, you’ll enjoy more workplace productivity, enhanced safety features, and have a reliable piece of equipment for years to come. But make the wrong purchase, and you’ll have to consider buying another lift in the near future. Plus, just think of all the problems that come with equipment that’s not suited to handle the task at hand. From frustrated workers to compromised safety, it helps to do your research when purchasing an aerial lift. The IBIS report touches on some important topics related to purchasing aerial lifts, and is packed with plenty of good information. The complete report is available for purchase from the IBIS.com website. The report is 15 to 20 pages long and costs $95. From here in the cheap seats, we present a few bullet points from the freely available content. -Things that affect the price of aerial work platforms include size, type and scope of the produce. -Factors that influence aerial lift prices are things like size, functionality and style. -Don’t be put off by high purchase prices. Most suppliers can make this up to you in the form of competitive prices for maintenance services. -Rental firms, retailers of construction equipment and the military are in a better buying position because they make high-volume purchases and because manufacturers are competing with each other for their business. -Other influences on aerial lift prices are such diverse factors as the price of steel (growing at an average rate of 3.3%), government spending and demand from contractors. -Buyers have better leverage with standard products as opposed to customized products. The full report goes into greater depth about product characteristics that affect the purchasing decision, supply chain risks, supplier benchmarking and advice on good questions to ask during negotiations and the best negotiating tactics. The price of a standard lift with the greatest reach capability can cost as much as $150,000 so if you are charged with the responsibility of procuring one, this is not something that you want to screw up. For 95 bucks, buying the full report is probably a good investment if you want to go onto the shop floor of your local aerial lift dealership armed with credible data and analysis. Ask the right questions before committing to buy. These include everything from operational tests to safety features and much more. Check the safety features. Check everything, then check it twice. From the framework to hydraulic hoses, be as thorough as possible! Consider a used lift. You can save a ton of money without sacrificing anything in the way of performance or reliability. As we mentioned before, always check the safety functions and everything else on used equipment. Training is Mandatory for Used and New Aerial Lifts – Sign up with CertifyMeOnline.net! Anytime you bring in new aerial lift to your company, always ensure your employees have the training necessary to operate the equipment. CertifyMeOnline.net offers a great selection of aerial lift and scissor lift certification classes, each designed to help any employee become a safer, OSHA compliant lift operator! Check out our prices and get started with your safety program. Thanks for visiting CertifyMeOnline.net! This entry was posted in Aerial Lift Training on October 31, 2013 by admin.